With the news breaking that junior-to-be guard Seth Allen has asked for, and been granted, his release it seemed appropriate to address the chaos and disarray that surrounds the Maryland program at the moment. After the mass exodus of a few weeks ago when Shaquille Clear, Roddy Peters and Nick Faust left the program Maryland fans may have hoped for a quiet offseason in preparation for their move the the Big Ten. Doesn't appear that was meant to be. There are rumors that Allen isn't the last player to leave this spring as sophomore Charles Mitchell has been mentioned to be considering a new home as well. With the departure of assistant coach Scott Spinelli to Boston College there is without question a sense that something is not right in Comcast Center. A similar sense of turmoil hung over the football program after Randy Edsall's first season. Edsall survived, at least for now, and it would seem that Turgeon will get time to calm things down and get Maryland back to the NCAA tournament. Having a top 10 recruiting class coming in certainly helps. Players like Melo Trimble, Trayvon Reed, Dion Wiley and Michal Cekovsky will be counted on early to contribute and much of this coming season will depend on their ability to play well from the start. With Allen's departure Trimble will be handed the starting PG position and will have to play his way out of getting close to 30 minutes a night. Let's hope he is focused on his conditioning. Once again a point guard will be leaving Maryland's program under Turgeon. He has about as good luck with PG's as Edsall has with quarterbacks. Stoglin, Howard, Peters and now Allen in three years. The frustration inside and outside the program seems to be coming to a boil. Usually on teams that underachieve there is some element of a locker room problem. Discontent was obvious at points this season. Faust, Allen, Mitchell, Wells, and Cleare all either had behavioral problems or expressed public displeasure with their roles. The addition by subtraction theory rarely works in real life. Think back to the dysfunction with John Gilchrist. It took another full season for some of the problem children to be moved out and the team to find new leaders. Don't expect instant success with some of the malcontents moving on in this offseason. Each player probably has their own individual reasons to transfer. Frustration with their roles, playing time, scoring, getting passed over by others could all be explanations. There is a broader concern about Turgeon's ability to manage his players and keep all the egos in check on his roster. So far he seems to be failing at that. Being the coach at a school that expects top 25 recruiting classes on a yearly basis and making sure that all of these heralded recruits fit well together is not as easy as it seems. It wasn't anything he really had to deal with at previous jobs. Still his time with Roy Williams and Larry Brown should have given him the basis to handle his own roster management. Williams may be a sub par tactician but he probably doesn't get the credit he deserves for managing a roster full of high school All-Americans and rarely having it blow up in his face. Want some silver linings? We'll find out soon enough if Trimble is the real deal. I'm not convinced he is ready to handle being a starter in the B1G from the moment he steps on campus. The last player who played at that level as a frosh was Greivis Vasquez. Those are big shoes to fill. Others are confident he is that special kind of player. Seth Allen could put it in the basket and probably would have impressed fans with a few big scoring nights this season. He was more of a scorer than a facilitator and probably would have struggled to make the rest of this team better. What did this team need: a point guard who could be efficient and help players like Wells and Jake Layman shine or a 40% field goal volume shooter who only played on one side of the ball? It should be no surprise to those who follow me on Twitter that I'm not enamored with Allen's skill set. I didn't think he would be able to regularly score at the ACC level but he proved me wrong on that point. He clearly lacks the instincts to play point guard in an offense that relies on structure and good decision making ability. I think defense and half court efficiency were bigger weak spots on this team than scoring. I didn't see a full season with Allen really improving either catagory. The team isn't better off without him and depth will certainly be another Achilles heal for Turgeon again. I certainly don't argue that his leaving is a good thing though I think it is a departure that isn't necessarily fatal. A transfer who is eligible immediately will be vital at this point. Turgeon needs to have a viable plan B should Trimble get injured or struggle. Too much of Turgeon's tenure at Maryland has felt rushed and slipshod. Cobbled together rosters of transfers, holdovers and malcontents that rely on too many things going right and too little planning for if things go wrong. There isn't much more time for Mark Turgeon to get things right. If Charles Mitchell leaves the only player that Turgeon recruited out of high school remaining from a team that played Iowa in the NIT semi-final a year ago will be Jake Layman. You cannot save your job by recruiting well if you have a track record of running off all your players. Whatever the source of the rot in College Park Turgeon needs to demonstrate he can get Maryland basketball healthy and thriving again, and soon. Is the 3-point shot killing Maryland? One of the major criticisms of Gary Williams' teams towards the end of his era at Maryland was that his teams never seemed to emphasize the 3-point shot. It was no secret that Williams despised the introduction of the 3-point shot in college basketball. Even decades after the rule was instituted he would still bemoan the over emphasis of the perimeter shot compared to old fashion basketball that wasn't just drive and kick to open shooters camped at the 3-point line. In year three of Mark Turgeon's reign at Maryland it is clear a new sheriff is in town. As you can see the proportion of 3-point attempts has risen significantly since Turgeon took over, see the red line above, and the percentage of points that come from 3-point shots has increased every year as well, see the orange line. 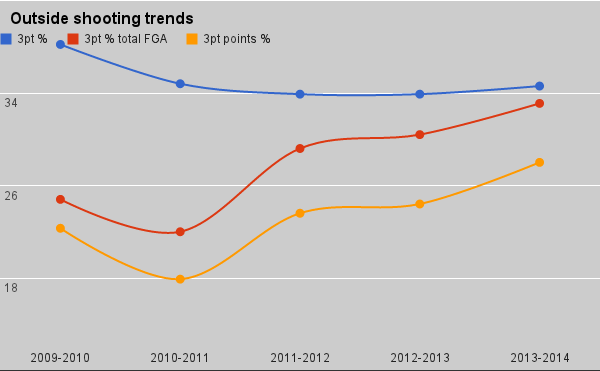 What has not increased that much is the 3-point shooting percentage, the blue line. The current rate of 34.6% this season is just below that of the 2010-11 season which was 34.8% to finish the year. That team consisting of shooters like Cliff Tucker, Terrell Stoglin, Adrian Bowie and Sean Mosley would not have been considered an particularly good group of shooters but there you have it. It is obvious that players like Smotrycz and Layman are better shooters than anyone on the 2010-11 squad but as a group the numbers so far this year are not superior. Taking more 3-point shots is not a bad thing, so far as you make more of them. Not only is the current Maryland team not making more 3-pointers than some of the past Gary Williams teams but they are less efficient to boot. Teams like Duke can be successful shooting threes because they have better shooters and have much better spacing and half court offense than Maryland. Teams that shoot lots of outside shots also need to be better defending teams otherwise they will be stuck in lots of high scoring shootouts, which is usually not a recipe for winning. The Terps are second in the ACC behind Duke in 3-point attempts in conference games. Right behind them are Notre Dame (2-5) and Virginia Tech (1-6). Poor defense and poor shot selection on offense are not unrelated. Perhaps Turgeon will continue to bring in better shooters than he currently has and his emphasis on the 3-point shot will start to bear fruit next season. Perhaps he will also get this group to improve on defense when they are not taking ill advised jumpers that lead to fast break points for the opponent. It is clear that this current group cannot execute the style of play that Turgeon wants his program to run. They will continue to shoot their way into games and out of games. The imbalance on offense with little production from a disappointing frontcourt and an over reliance on inconsistent wing players has made for an up and down season. Has the disappointing season been the result of poor player development, overrate players who are not living up to their recruit rankings, a offensive scheme that doesn't fit the current squad or perhaps all three? It has been longer than a while, friends. In truth my long absence has been as much to do with a rising apathy regarding Maryland's revenue sports as it has with life and work getting in the way of my writing on this blog. Where to begin? I have missed so much that perhaps it would be best to just discuss a few things I have been thinking about and perhaps touch more strategic issues in the process. Randy Edsall's football team finished up a forgettable season against Marshall in the Military bowl. Marshall was a better team. The patchwork defense, which will require a major overhaul to compete in the Big Ten, showed some of the frailties it did earlier in the year against the likes of Clemson and FSU. The play at safety and linebacker was at times dismal but the strategy wasn't putting players like Nixon in the best positions. Linebacker Cole Farrand was missed more than you would have thought. That group will need a significant injection of talent or individual improvement to withstand the more physical conference Maryland is moving to next year. Yannik Cudjoe-Virgil and Yannick Ngakoue may both make an impact coming back from injury and maturing to take a more substantive role respectively. It isn't that the season was horrible with a 7-6 record but there are reasons to be concerned as to whether this program is ready to compete against better competition. Michigan and Penn State may be down historically but Michigan State and Ohio State are as good as any teams in the country. Throw in crossover games against Iowa and Wisconsin next year and that is as tough a schedule as Maryland has played in recent memory, perhaps ever. I doubt anyone needs an anicdote to remind them that the Big Ten is a football conference but consider that the football schedules are out for the rest of the decade, to 2019, including dates. The basketball team doesn't even know who it will play and how many times next season. Seeing the blank stare on Randy Edsall's face as Marshall scored the final touchdown to wrap up the victory seemed appripose. Edsall is a decent coach, but not much more. At a place like Connecticut he can do well but you get the sense that in a conference like the Big Ten he will be out of his depth. Expecting much more than 6-6 seasons from him in a highly competitive league seems wishful thinking. With the help of Mike Locksley he has improved recruiting but quality depth across the roster is still lacking. The hand wringing over prized recruit Jalen Tabor picking Arizona over Alabama and Maryland seems a little overwrought. He is the kind of player that never even considered Maryland towards the end of Ralph Friedgen's tenure when a parade of local prep players left town every season. Tabor hinted to the Baltimore Sun that there may still be discontent in the locker room towards Edsall. That could be an ominous sign but Edsall has done well for himself in shipping out many of the malcontents from the prior regime. Still there is a lingering feeling that Edsall is unlikely to change Maryland's fortunes and motivate many local stars to view playing in College Park differently, Stephon Diggs notwithstanding. Edsall doesn't seem to be "transformational" in regards to anything. He is actually the opposite, and one of the more uninteresting coaches in college football today. I view Randy Edsall as a placeholder coach. Until Maryland can fix its broken finances and pay the kind of money they will need to attract a better tier of head coach he will have to do, but it could be worse. Kevin Anderson gave a bizarre vote of confidence to Edsall in the bowl media sessions responding to a Internet fart in the wind report by another blog. Why would he even respond to such a thing? Anderson's incompetence probably should not be underestimated but it indicates that the hot seat has only cooled off slightly with a bowl bid and winning season. There is no money to fire Edsall regardless but with a Big Ten slate that starts with Ohio State, Iowa, Wisconsin and Penn State as four of the first five opponents things could get interesting for Edsall by early November. The state of basketball program under Mark Turgeon is hardly much better these days. A dreadful 9-5 record with ACC play starting in earnest means that the Terps will probably have to finish with a 11-7 conference record to have a serious chance of returning to the postseason for the first time in four years. The surprising weakness of the "greatest basketball conference ever" gives Turgeon a little hope that outside the top four teams no one in the ACC seems particularly good. If his team gets hot at the right time they could come back from a dismal start in the non-conference. I don't see that as probable. Even with Seth Allen's return this is a flawed group that lacks basic fundamentals on defense. It is concerning that with some decent talent Turgeon has been unable to mold his teams of the last two seasons into tournament worthy groups. The horrendous beat down that his team took at Ohio State and the loss to an up and coming Iowa team in the NIT last season should give any fan pause that the Terps will walk into the Big Ten and compete at the upper echelon. The injection of a few recruits can quickly change a basketball program's fortunes in a way that they cannot in football so perhaps the heralded group coming in the fall will cure many of the ills of this current program. Still, it isn't so outlandish to believe that Edsall's group may have a better chance of surprising everyone with their competitiveness in the new Big Ten than Turgeon's bunch. I think the jury still has time to render a verdict on Turgeon whereas Edsall is probably just waiting out his sentence. Neither man is a "home run" hire at a time when Maryland desperately needed one of them to be that. The hope is that the Big Ten money will begin to flow in and that when the time comes Maryland will have someone with more wisdom than Kevin Anderson to pick the right man should the need arise. I am excited about the move to the Big Ten and the renewed initiative to fund raising at Maryland. It wasn't just the lack of leadership in the ACC or Debbie Yow's mismanagement that has been holding the Terps back from a bright future, it has been us. Maryland fans have not held up their end of the bargain. Sorry, but it is true. The poor product produced by the basketball and football programs is certainly an excuse not to go to games, attendance had been trending down before either of the current coaches arrived, but is facile to expect the results will improve if everyone thinks this way. If the fortunes are going to improve then the fans will have to be a significant player in the improvement. One cannot rely on benefactors like Kevin Plank to make it all better. If Terp fans take ownership of the athletic programs and Maryland changes the way that they deal with boosters then both sides can work together to build something sustainable and successful. It has been a while since I have posted on this blog but in light of today's events I felt the urge to add my thoughts to the collective on Maryland's move to the Big Ten. Back in 2010 when the conference realignment was kicking into high gear I wrote that Maryland could not and should not refuse an invite from the Big Ten if one was offered. It seems that Notre Dame's laughable half in and half out deal with the ACC may have been the trigger for Jim Delaney, Big Ten commissioner, to make the move that had been brewing in Chicago for quite a while now. That decision is Maryland's opportunity. The financial troubles of the athletic department have been well chronicled. With the financial mismanagement of former AD Debbie Yow the revenue and budget gap for Maryland is getting bigger every season. How did we get here? The football and basketball programs began to decline around the same time losing ticket sales and resulting in declines in Terrapin Club members. The economic crash in 2008 certainly didn't help matters, nor did the ill fated decision to add luxury suites at Byrd Stadium in the midst of the worst recession in modern times. Profligate spending on non-revenue sports by Debbie Yow certainly exacerbated the bleeding. In the past budget shortfalls were covered by the use of one time sponsorship deal income or one time donations instead of consistent revenue. Now that those sponsorship deals or one time donations have largely been drained and the budget gap is a growing threat to Maryland's competitiveness. Faced with a dire financial forecast President Loh and AD Kevin Anderson did not have many attractive options. They were forced to make painful cuts to programs, paring down the number of scholarship programs to 20, and putting the athletic department on a hard road of austerity measures. When the normal funding of conference television rights and poor fan spending cannot make up the shortfall you have to change something. Maryland's apathetic fanbase probably isn't going to change any time soon and the ACC's sad television deal isn't up for renegotiation until after creditors started showing up to pull the copper wiring out of Comcast Center. As Pete Thamel reported on SI.com Maryland will stand to make $12 million more in 2014 than they would have they stayed in the ACC. The numbers only get bigger from there to where they expect to bring in $42 million in revenue in 2017, which is almost double what the ACC stands to be paying its members. It is understandable to approach the move to the Big Ten with melancholy but there is a real danger of crossing over into sentimentality. The old ACC has not existed since 2004 when we went through the initial round of expansion. The round robin disappeared and ACC basketball began a quiet decline. Those battles with traditional Tobacco Road opponents and longtime ACC rivals like Clemson are going by the wayside. In 2015, for basketball, six teams on the schedule would be former Big East programs. Games against Boston College, Notre Dame and Syracuse have nothing to do with the great history of the ACC that Maryland has been part of in the past. A indication of this was when Pittsburgh was named Maryland's primary partner. Maryland has more recent basketball history against a handful of its future Big Ten opponents than Pitt. If that is the direction the ACC is going then there is little point in maudlin nostalgia about the great rivalries that won't occur going forward. Maryland had a choice of staying in the ACC for emotional reasons and living hand to mouth or potentially thriving in the Big Ten run by executives who understand where college sports are going to be in a decade. Given those option there really isn't any choice. There will be many bittersweet elements to this divorce. I will miss rivalry games against Virginia and the sometimes fanatical devotion to basketball that was part of the fabric of the ACC. At the same time it is an unavoidable conclusion that the smug belief among ACC-philes that it is the best conference in the country hasn't been true for a while now. North Carolina and Duke continue to chug along while the rest of the league fail to contend for any significant achievements. The inclusion of football lightweights Pitt and Syracuse is a reflection of the insecurities of the basketball coaches in the ACC and more than a little envy at the Big East NCAA bid numbers the last few years. On balance this a move that Maryland's administrators had to make for the future of the sports programs. Maryland can choose to live in a threadbare, dilapidated mansion continuing to hold onto golden memories or take a risk of building a new future with new challenges. I've probably used that turn of phrase before regarding Maryland sports but I'm too lazy to look it up. Morale in Terrapin Nation is not at all time high levels. The 18 point loss to Duke in basketball reminded everyone how far the Terps are from being a top team in the ACC. The friction between Terrell Stoglin and Mark Turgeon bubbled over after the game with Stoglin taking to twitter to complain about getting benched. Three more players decided to transfer from the football team including QB Danny O'Brien. While Randy Edsall did have a huge recruiting victory when WR Stefon Diggs of Good Counsel signed with Maryland over the likes of Ohio State and Florida it seems like every time he goes out in the media he just makes things worse. The problem is you cannot have your head coach hiding under a rock but Edsall is like a politician who drops in the polls every time he gives a speech. The head coach needs to be the face of the program. The question is whether the rift between a sizable number of fans and Edsall is irreparable already. The amount of animus between Edsall and the fanbase is unlike anything I have seen. Many fans have lost all reason in their desire to see Edsall fail. When some fans would rather see the program struggle so they could get rid of a coach you know things are poisoned. Then again a vocal minority of fans wanted Gary Williams gone both before and after he won a national title. For my part I don't think Randy Edsall is a great coach but neither do I harbor any real dislike for the man. If he was successful at Maryland I wouldn't have a problem with him. His grooming standards and rules for players are of little consequence to me. His stilted and wooden persona in the media makes it hard for any fans to really embrace him. Even if he is successful in the coming years he will likely never be embraced by the entire fan base. In that sense then the Edsall regime is already a failure and Kevin Anderson's hiring of him was a mistake due to his failure to access Edsall's suitability to the culture at Maryland. With Mike Locksley bringing in the top talent in Maryland it will almost certainly raise the fortunes of the football program. In a number of weeks Locksley has landed more talent than the Friedgen and Franklin pair did in their final three years. When the fortunes of the team do turn around it is almost certain to create an uneasy stalemate between those fans who have grown to hate Edsall and those who only desire a winning program. I can only great the transfer of Danny O'Brien with a shrug. I wasn't convinced he was going to be the starter going into the fall regardless. His play last season was abysmal and putting aside issues regarding the system and the quality of his teammates he struggled with basic reads and decision making at the QB position. It was one of the worst seasons by a Maryland quarterback since Joel Statham in 2004. Chris Turner's 2009 season with an equally putrid 2-10 team was better. With a good offensive line, decent running backs and one of the better wideouts in Maryland history O'Brien looked good as a red-shirt freshman. Without all those elements he was one of the worst quarterbacks in the ACC. That isn't an elite player. Perhaps he will transfer to a program that is loaded with talent and he'll flourish distributing the ball to the kind of elite players that Maryland does not possess at the moment. I tend to doubt that will happen. O'Brien worked hard and was a good representative for the University. He'll graduate in the spring and move on somewhere else. It would have been good for Maryland had he stayed but it isn't as if the program has lost an elite player either. It wasn't surprising that Maryland lost by 18 at Cameron. Once again Mark Turgeon tried his outside-in defense and it resulted in the Plumlee brothers dominating Maryland's big men. Alex Len got into early foul trouble and that pretty much obliterated any slim chance Turgeon's strategy would work. Ashton Pankey, who hasn't played a good game in weeks, and James Padgett had little chance to stop the assault in the paint that Coach K unleashed. The only real bright spots in the game were the play of Mychal Parker and Nick Faust. Both showed they can by dynamic players on the wing and it may be a blessing in disguise that Pe'Shon Howard's injury will ensure that these two will get extended playing time as the season draws to a close. Howard wasn't playing well before his injury and I doubt it will make a significant difference in the fortunes of the team. I saw this as a 6-10 squad before he was injured and I don't see that changing. What could make a difference is if Stoglin decides to check out like Jordan Williams did last year down the stretch. I think Turgeon has totally mishandled this situation with Stoglin. His criticism of Stoglin in the media has been surprising and shockingly inept for a coach of his tenure. It is important to note that Turgeon has never been a coach at a program with the profile and location of Maryland. With all due respect to Texas A&M it probably did little to prepare him for that it would be like at a school with the expectations of Maryland. Turgeon's seeming inability to deal with Stoglin outside of the media eye has given me my first doubts about his ability to return Maryland to its former glory. If he cannot deal with the ego of a player like Stoglin then how will he be able to recruit and coach elite high school players who are almost all divas in some way? I think the way that Gary Williams handled the cancerous junior season of John Gilchrist would be educational to Mark Turgeon at the moment. Hammering away at Stoglin after every loss, notice when Stoglin bails out the team with his scoring there isn't much comment from the coach about his lack of assists, serves no purpose and seems to betray a lack of ability to coach a potentially difficult player. Stoglin bailed out his coach who was flummoxed by Brad Brownell's 1-3-1 zone gimmick in their 64-62 squeaker against Clemson. Without Stoglin this team may have two ACC wins and no one would be talking optimistically about next season. More to the point if Turgeon mishandles Stoglin and the sophomore decides to transfer you can push back Maryland's return to the NCAA tournament until at least 2013-14. With Sean Mosley departing and only a lightly recruited guard in Seth Allen arriving next fall the backcourt would be one of the weakest in the ACC without Stoglin. The Terps get Boston College at home later in the week and then travel to UVA before hosting Miami next week. It will be a pivotal stretch for the team and a potential turning point for the coach and his relationship with the squad's only star player.